Not to be confused with Dorrie. Plessie is a friendly character resembling a nothosaur (yet referred to as a "dinosaur" by Nintendo) that debuted in Super Mario 3D World. 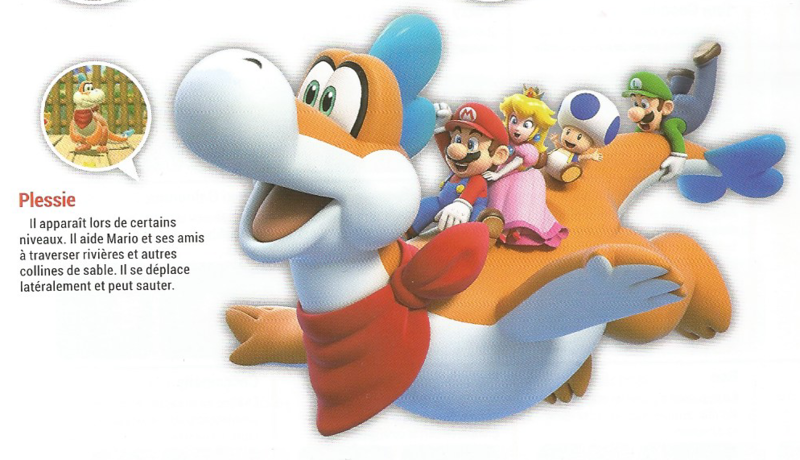 In the game, it allows the playable characters to ride him through certain levels, similarly to Dorrie in Super Mario 64 / Super Mario 64 DS and New Super Mario Bros. Plessie's name is a portmanteau of "plesiosaur" and "Nessie." The former is an extinct group of large marine reptiles that are often confused as dinosaurs, whereas the latter is the nickname given to the Loch Ness Monster. Its design share some features with the design of Yoshis, such as the bipedal posture with short legs, the white soft tissue that spans the lower part of the body, big oval eyes pointing forward which feature a white sclera, the nostrils being hosted near the top of a round protruding end of the upper part of the muzzle, and a crest on the back of the head, although the shape of the latter is different. They also share the same suffix, -sshi (「ッシー」), in their Japanese names. Plessie first appears in World 1-4, Plessie's Plunging Falls, where Mario and company must ride it through a river to reach the Goal Pole. It also appears in World 5-1, Sunshine Seaside; World Bowser -2, Plessie's Dune Downhill, where it slides through sand; World Bowser -5, Deepwater Dungeon; and World Star -1, Rainbow Run. Plessie also makes a few cameos outside of these levels. In World Crown - Crown, Champion's Road, it appears at the end of the stage alongside other friendly non-playable characters gather to congratulate the player. It also appears in the game's title screen, and in the credits scene. To control Plessie, players can tilt either the control stick or control pad, depending on the controller. To speed up and slow down, players tilt up and down respectively. Players can also press the jump button to jump, which can be used to defeat enemies and reach higher ground. If more players are riding Plessie, they can cooperate to tilt it further. If Plessie falls off a course, however, the lives lost is dependent on the amount of players riding it. Plessie appears in Super Smash Bros. Ultimate as a support spirit. It gives fighters the ability to remain in the water indefinitely. The fight to capture the spirit takes place on Great Bay, against a giant Yoshi simulating Plessie. Despite being named after plesiosaurs, Plessie is designed after a bipedal nothosaur. Besides being three to four times as tall as Mario, even though the artwork made for the Super Mario 3D World Original Soundtrack shows it being around twice as tall as Mario, Plessie is visibly fat, and this trait is actually used to slide on the belly outside bodies of water. The bottom of each foot, including the toes, is fully covered by a white pad. Furthermore, the back features four darker stripes with rounded borders that are perpendicular with respect to the tail. Plessie's head features two big eyes, each with an orange eyelid, a white sclera and a big oval pupil surrounded by an aqua green iris. Furthermore, the upper part of the muzzle is elongated like that of a crocodile, with a white protruding end hosting two nostrils near its top. The tail is long and ends with a three-lobed structure resting on the coronal plane, similar to the crest and having the same cyan color as well. Plessie is always seen wearing a red bandana knotted on the left side of the neck. Puresshī From 「ライド」 (raido, ride) and "-don", a common suffix for dinosaur names. Also, possibly a pun based on the English "Ride on". Reused as the basis for the Raidon Bus in Super Mario Odyssey. From Plesiosaurus and seemingly Yosshī and/or Neshi. French (NOA) Placidon Portmanteau of placide (placid) and "-don", a common suffix for several dinosaur species' names in French. Plessie being petted in Deepwater Dungeon. Before and after riding Plessie, the GamePad player can pet it by rubbing it with the stylus. Doing so makes it laugh and give them five Coins. 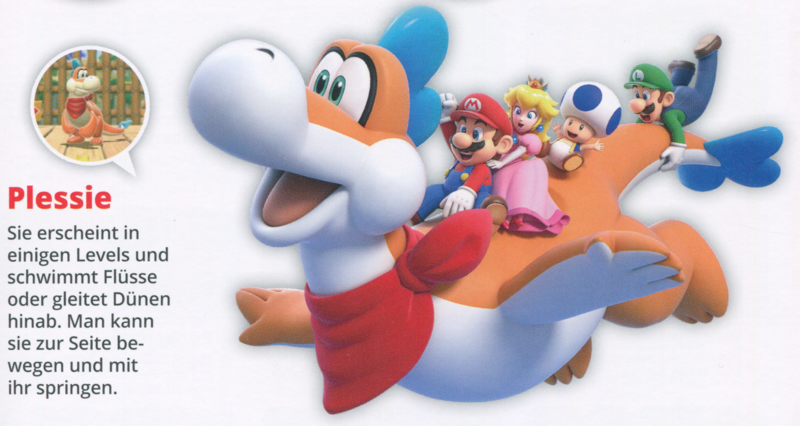 The music that plays while riding Plessie in the levels he appears in is an arrangement of "Slider" from Super Mario 64. The official European sites of Super Mario 3D World feature a short description of Plessie in which it is stated to be a dinosaur, referring to it as a male in languages where the term dinosaur is typically male. However, in the German translation of the Encyclopedia Super Mario Bros., where Plessie's species is not stated, it is referred to as being female. ↑ Game World section of the official UK and Irish site of Super Mario 3D World. The text referred to Plessie is Meet Plessie, a helpful dinosaur who just loves to ride down rapids! ↑ Plessie's bio on page 225 of the French translation of the Super Mario Bros. EncyclopediaMedia:PlessieESMBFre.png, in which the use of il (he) could indicate either a male or undetermined gender for Plessie, as masculine gender can also have a neutral meaning in French. ↑ Plessie's bio on page 225 of the German translation of the Encyclopedia Super Mario Bros.Media:ESMB German Plessie.png, note the use of sie (she) and ihr (her) indicating that Plessie is female. On the other hand, in the Game World section of the official German site of Super Mario 3D World, Plessie is described as being a dinosaur (Lerne Plessie, den freundlichen Dinosaurier, kennen, der total gerne durch Stromschnellen gleitet!) and is thus referred to as male, as can be seen by the use of den freundlichen Dinosaurier and der. This page was last edited on February 17, 2019, at 15:07.